Sustainable plantation radiata pine forests reach maturity in about 28 years. Produced from these forests in the Nelson region, GoldenEdge Medium Density Fibreboard and NelsonPine Laminated Veneer Lumber are viewed favourably as substitutes for tropical hardwoods which take 200 years to reach maturity. Nelson Pine Industries Ltd has adopted production processes that are environmentally sound. There are systems in place to minimise dust, water use, effluent and noise. ISO 14001 Nelson Pine Industry’s environmental management system is certified to comply with the internationally recognised standard, ISO 14001 Environmental Management Systems. Environmental Choice GoldenEdge MDF is certified to meet the New Zealand Environmental Choice standard EC-32-14 Furniture and Fittings. FSC™ Nelson Pine Industries Limited has Forest Stewardship Council™ Chain of Custody certification. FSC™ is an independent, non-governmental, not-for-profit organisation that promotes the responsible management of the world’s forests, and provides internationally recognised forest certification. With Chain of Custody certification NPIL can supply product labelled “FSC™ Mixed Sources”, showing that a proportion of the wood used is sourced from forests certified to meet FSC™ criteria for well managed forests and the rest is from other sources deemed to be low risk. Super E0 This is product range with very low formaldehyde emissions, similar to levels emitted from kiln dried wood. In 2005 Nelson Pine Industries became the first MDF manufacturer to offer only products that meet the JIS F**** standard to the Japanese market. CARB PHASE 2 NPIL has certification under the CARB system, now required in America. 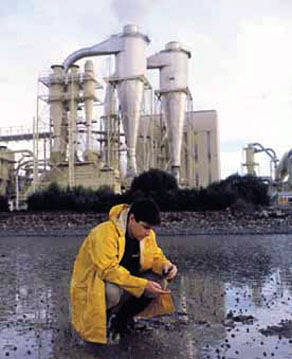 CARB stands for the California Air Resources Board,It is a part of The California Environmental Agency. Its control measures, put in place in 2008, have been adopted across North America to reduce emissions from composite wood products, including MDF. Meeting the CARB emission standard meant making some minor changes to the recipes of the products, putting a tighter testing regime in place and adding a new system of accreditation for the staff in the NPIL lab doing the tests. Compliance is tested quarterly by a third party. In 2012 Nelson Pine Industries won an EECA Energy Award for its moves to save electricity through modifying and enhancing its production systems. More information on environmental subjects, in printable form for school project use etc, can be found at Education Downloads.